I just saw THIS and if you like birds and art you will love it!! I have a love/hate relationship with spring. I love the new growth, the flowers, the birds returning and all the lovely shades of green. I hate the fact that my eyes swell up, the sneezing, and the sniffling. I'm sure people must wonder what on earth is wrong with me because I go about looking as though I've been through a huge crying jag. All this despite living on extra strength allergy meds. Argh!! Oh well, once the trees are in full leaf I will be able to breath again (I hope). 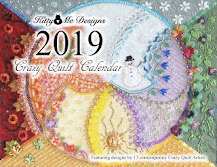 I found this site (via Kathy of Shawkl) and thought I'd pass it along to you.... go HERE for a new source for crazy quilting supplies. And if you'd like to visit Kathy too, go HERE. 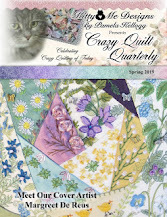 There are some other sources of CQ suppliess that I know about: HERE, HERE, and HERE. If you know of any more, please feel free to add them in the comments!! are past due for this month. who have been waiting for pictures! Oh yeah, and I even got a new ORT jar for the occasion!! EDITED TO ADD: Oops, should have explained what 'ORTS' are - the little leftover bits of thread from your sewing projects. AND..... I also have to apologize because the info regarding who originated the TUSAL was on my ailing computer and not on this one. If anyone has the correct info would you mind putting it in the comments....thanks! Hi all - it's me, back again from the computer-less abyss - thanks be to #2 son and his computer wizardry. Apparently my hard drive fried, for reasons only known to itself, and left me high and dry. He has installed a new hard drive and is now hard at work re-installing the rest of my programs. He kindly loaned me the use of his notebook until we can get together and he can return mine. I've been curious about using a laptop/notebook and have decided that they really aren't for me, at least not for the long haul. It's fun to experiment with this little thing but I find the mouse being at the base of the keyboard to be beyond frustrating. I was a secretary and spent years typing and can't get my head around the keyboard not being at the bottom edge. I know - I need to get with the times! Anyway, I'm back in a limited way. There won't be any pictures for another couple of weeks and you'll just have to put up with my mumblings. Poor you!! This is MA's number 2 son (I think that is how she refers to me).. My mother seems to have a virus... Yes, you guessed right, now I HAVE to fix it! She will be coming to my place on Saturday to have her computer fixed. So go outside and enjoy the weather! She will be back soon! With all the current problems with comment and word verification I thought you might like to check out this post that Karen has done on her blog 'Sew Many Ways'. She tells us exactly how to best deal with the issue and step by step too. Go HERE. Here's another of the books I got at the second hand book store at a REALLY good price! This book is what could be classed as a 'coffee table book' and was published in 1986 at which time the cover price was listed at $95 US. I managed to bring it home for $25 which I thought was a steal. The inspiration in this book is absolutely astounding, even though I have no intentions of trying to make any of these pieces. I will have fun reading every word though and drooling over most of the pictures (all in colour, I might add). In the early 19th century Mrs. Beeton wrote the very famous 'Mrs. Beeton's Book of Household Management' and followed that with an equally fascinating tome about needlework. I, of course, being a collector of embroidery books, have wanted to actually have a look at that book. I was amazed to stumble upon it at a used book store - for the princely sum of $4!!! I nearly fell all over myself grabbing it up! This copy is facsimile edition published in 1986 - the original was in 1870. I've included just one of the fascinating pictures here - the 592 page book is filled with hundreds more.